On October 5, anonymous street artist and art-world prankster Banksy shocked onlookers at Sotheby’s (and subsequently the world) when the artist’s beloved “Girl with Balloon” was sold at its London auction for the equivalent of over $1.2 million then proceeded to “self-destruct.” After the work slid from its ornate frame, shredding like office paper, a question remained, what happens next? Thanks to a statement from Sotheby’s on Thursday, we now have an answer. 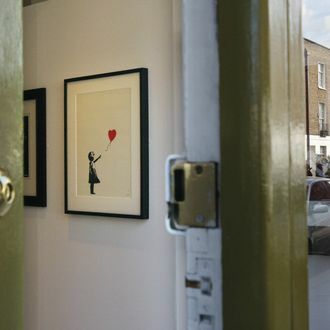 Like a phoenix rising from its ashes, the tattered “Girl with Balloon” by Banksy has been reborn, recertified, and renamed as “Love Is in the Bin,” and the winning bidder is keeping the work, strips and all. That same day on Instagram, Banksy wrote a quotation, “The urge to destroy is also a creative urge,” attributed to Picasso, along with a video showing how the shredding device was built into the frame. If you happen to be in London this weekend, the “new” work will be on view to the public at Sotheby’s new Bond Street Galleries on October 13 and 14.